Sarees are six to nine yards of pure elegance, and everybody’s mother’s wardrobes are filled with sarees of different, color, texture, and pattern. But the hardest thin g to do is to accept that sometimes a saree has just lived its life and it just can’t be worn any further. However if that is the case, then instead of just throwing them away, why not get your creative juices flowing? There so much you can do with a material that is nine yards long! 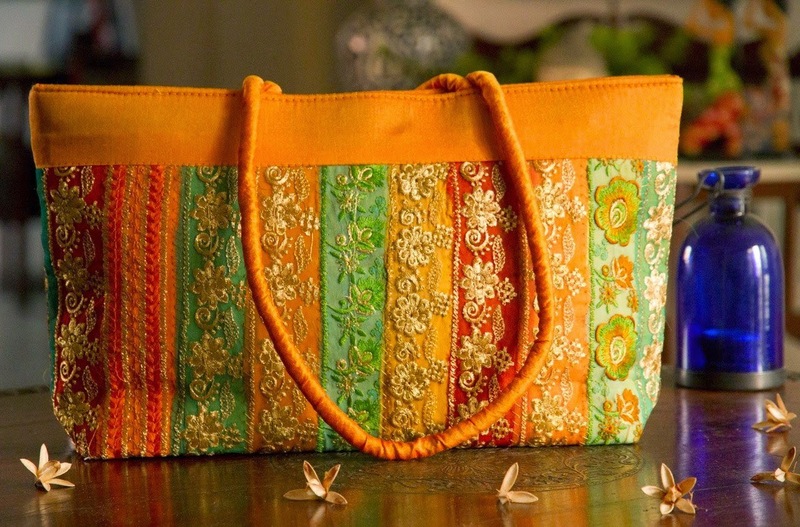 Moreover the pallus will add an extra dimension to whatever you make with the saree. So below is a very long list of the things you can do to repurpose an old saree. So what are you waiting for? Pul one out, put on your artist hat, and get going! Use a saree to make a bolster cover or a cushion cover and use the borders of the saree as piping. Make pillow cases out of them. You can print more designs on the saree, and voila you have your very own custom made pillow case. Make curtains out of them. 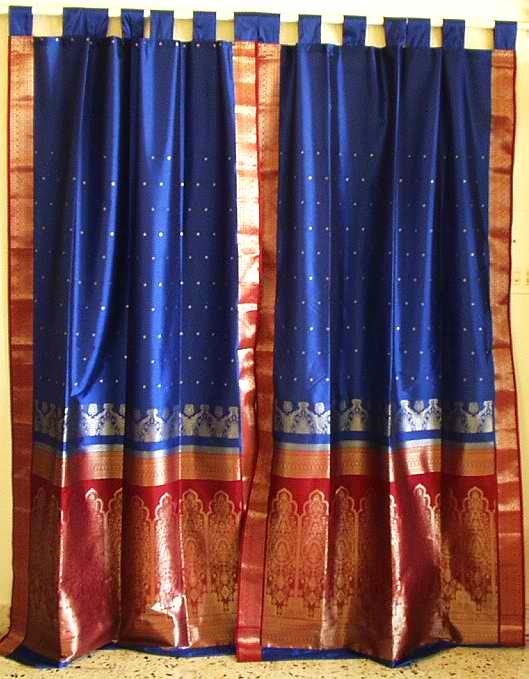 Sarees make amazing summer curtains, whether its for your door or your window. They are sure to add an ethnic touch to your room décor. Use it to make a table cloth, and use the borders of the saree to make a border for your tablecloth. Make table runners, because of the length of the saree, you can use it to make very long table runners, and you could sew on tassels on the edges. As place mats. Make a quilt out of your sarees, use the saree borders as piping, and you have custom made table mats you can use on special occasions such as diwali. As a throw. You can make a long quilt your of your saree, and use it to keep your favorite reading chair or bean bag warm. As a screen. Screen of your bedroom elegantly using a saree and a wooden frame. Privacy and beauty all at once. As pot holders. Every households needs pot holders, so why not re fashion a saree into one? As a water filter. Is your water filter not working? No worries, use a saree instead. Just fold it a couple of times and run your water through it, the result is filtered, drinkable water. As a bed canopy. Use a saree to make a bed canopy to give your room and old fashioned vintage touch. As a wall hanging. A bright, colorful saree as a wall hanging can easily jazz up a boring and plain room. As box covers. Got unsightly storage boxes around? Just throw a colorful saree on top, and you can disguise them beautifully. As Christmas stockings. Using your red and green sarees, make Christmas stockings. Monogram them or personalize them in some other way, and you can give them as awesome homemade gifts. Make portable laundry or shoe bags out of them. It will make packing easier for you, and it will also be simpler to find things. As floor mats. Make several plaits out of your old sarees and stitch them together to make a soft and colorful floor mat for your bedroom. Make them into coasters. Make small quits out of your sarees and you have your own personalized coasters to keep your glasses on. Make quilts out of them. Take multiple of sarees of different colors to make a bright and colorful quilt four your bed. As a bed sheet. Re-purpose an old saree and make soft bed sheets for your kids to sleep on. As wall art. Fabric wall art looks super cute. Just frame a saree with a geometric print, and hang it on your wall. Use them as drawer liners, infused with scented lavender. Cut out and sew a huge pocket with your saree, put in some dry lavender herbs, and sew the opening close. Keep it in your drawer and it will keep you clothes smelling amazing. Make a banner out of them. If you are making banners for a sport even or for some other gathering, a saree will do your job perfectly. Just paint on your message, and hang the saree by two poles on the sides. Make chair seat covers. Cut and sew your old traditional sarees and make them in to chair covers, they will instantly add an elegant touch to your room. Make a letter holder. Make a gorgeous letter holder with pockets using your old saree. Hang it in your house or at your office and it will look decorative and stylish. As dust cloths, this is the last resort for sarees that just cannot be saved or re-purposed in to anything else. Use it as a sieve to make hung curd. This is an old, but very useful tip. It can help you to make cottage cheese or paneer for your favorite Indian dishes, or you can use it to get thick and creamy, greek yogurt. Make silk thread wrapped colorful bangles. Just buy cheap plastic bangles, take out silk threads from an old saree and wrap it around the bangles. Make a scarf out of it. The number of scarves that one saree can produce is endless. You can make them and give them as gifts to people. Use the ones with simple patterns to wear with western clothing, and use the heavy dressier ones for ethnic wear. Make soft handkerchiefs for your kids or for yourself. Make a bandanna. Making a bandanna out of an old saree will give you a very ethnic and stylish yet edgy appearance. Turn them in to bags. The various kinds of bags you can make is never exhausting. 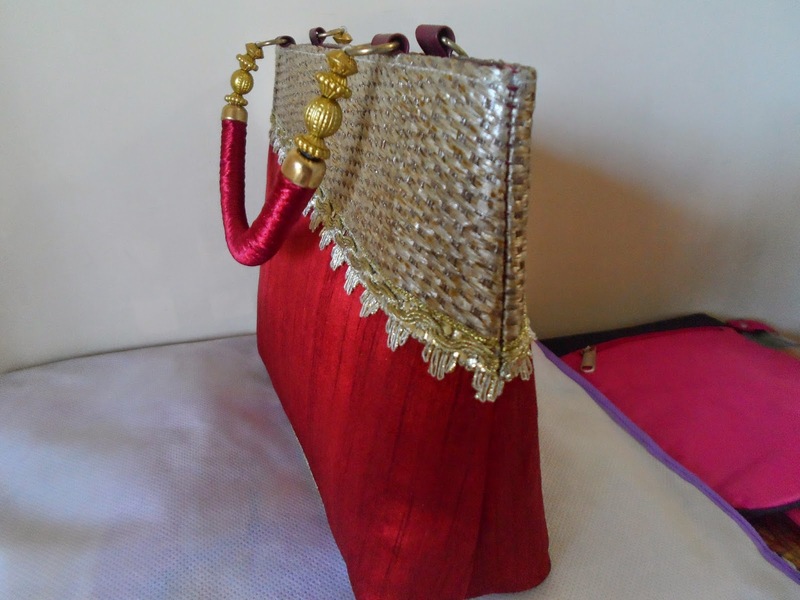 Whether they are clutches, totes, slings, or evening bags, you can make them all. Tiny coin purses, these things are adorable, and quite handy, as you wont have to dig around for loose change in your huge side bag. Make them out of your saree, and you will have one like none other. Make soft shoes for babies. Make tiny booties for your baby, and they are sure to be one stylish toddler! Make a spectacle or sunglass case. Prevent your eye wear from getting scratched and put them in your very own hand made spectacle case made out of an old saree. Mobile covers, same as above, give your cell phone an ethnic and stylish by fashioning a cover for it using a saree. A laptop or tab sleeve, make a huge envelope using an old saree, sew on a button at the top and a whole on the other side, and you have your very own laptop or tab sleeve. Make headbands, just buy cheap plastic headband, and wrap them with an old saree, and you get an ethnic yet funky look. Pins or broaches, make small flowers or whatever you wish out of your saree and stick them on to a safety pin, and you now have a personalized broach. 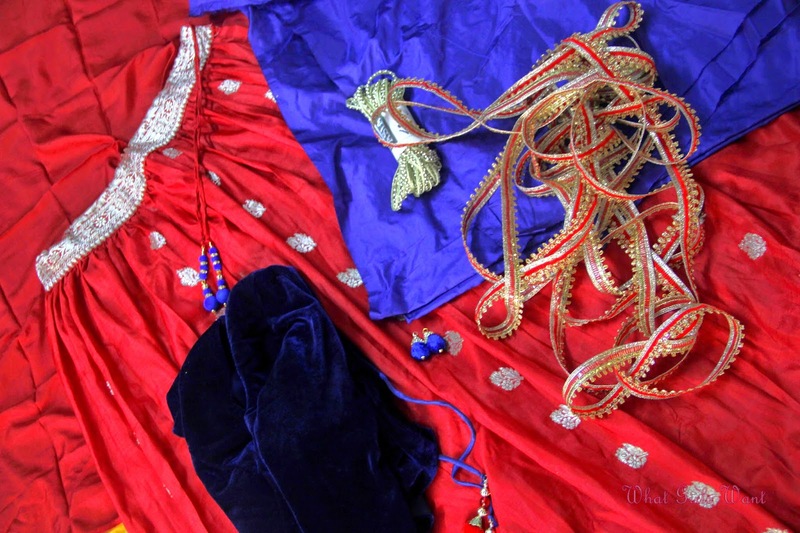 Make a full Salwar Kameez out of an old saree, and buy a dupatta to go with it. Make a wrap around skirt, or any type of skirt. You can turn any saree in to a skirt of your choice. Make a kurti, whether long or short, you can use a saree to make it. Team them with jeans or leggings and you are good to go. Make a dress! These look gorgeous, honestly. Go in to designer mode and you can make any kind of dress, whether a strappy one, or a gown, or anything. Make an unique pant out of them, they look great with a normal sleeveless black top. Experiment and have fun with it. Make an awesome patchwork jacket. Use the pallus as appliqués on other jacket or saree blouses.